Fifty conversations exploring the many different shades of being "gay" in America. This conversation focuses on the degrees and varying perceptions about how people define themselves, their lives, struggles and triumphs. Featuring Kathy Najimy, Between the Shades has drawn rave reviews after successful runs at twenty-one different film festivals nationwide. With anti-transgender bathroom bills sweeping across the nation, The Human Rights Campaign called 2016 the most in 2016. It became quite a dangerous year for transgender Americans. Filmmaker Vlada Knowlton captured the ensuing civil rights battle from the perspective of a group of embattled parents - including herself and her husband who are parents of a young trans girl and are fighting to protect their children from discriminatory laws in their home state. While Knowlton passionately follows the story of anti-transgender legislation, the real heart of the film is in the stories of the families who accept and support their kids for who they are. This is a very important documentary with a focus on families fighting against anti-transgender rights legislation. Director Knowlton's youngest daughter was five years old upon coming out but started showing signs of being transgender two years earlier. The director states in the film that "it was a terrifying time for us." It was quite a struggle to accept the child's gender identity and the next year proved to be even worse. In addition to their daughter, the film follows four other families--- the Trainer, Mitchell, Kelly, and Blakefield families. All of them have a transgender son or daughter. By focusing on the children, Knowlton is able to show how vulnerable LGBTQ youth can be. The discussion of transgender people and how we're perceived must include the medical community. We hear from Drs. Kevin Hatfield and Johanna Olsen-Kennedy who push that being trans is not a mental illness and one's gender identity is in the brain. Knowlton's film comes from a place of great personal vulnerability, truth, and conviction. In 2015, she and her husband were coming to terms with their 5-year-old child's transgender identity. Only a handful of months later, in 2016, a number of initiatives and political power plays would result in a push to rescind transgender rights laws and policies that the State of Washington had put in place in 2006. Over the course of 90-plus minutes, Knowlton somehow finds a way to share her story, step back from the personal connection to the film she's making, and present an engaging, factual, and galvanizing look at the myths, dangerous lies and misrepresentations that have bolstered a bustling and increasingly troublesome anti-trans movement since progress had been made towards equality for transgender individuals. At the heart of the film is Aidan Key, the founder of Gender Diversity, a Seattle-based advocacy and support group for transgender individuals, with an emphasis on transgender youth. Key spends significant time working with public school districts, helping break down the misconceptions around understanding transgender identity and assisting with tools that steer districts toward integration and acceptance. The Knowltons got to know Key in 2015, when they went to Gender Diversity to find resources for their daughter Annabelle. Upon learning of Knowlton's status as a documentarian, he sought her help in what he knew was emerging on the horizon in 2016. Though Knowlton could treat Backholm with disdain and mockery, she doesn't and her message is firm, her focus sharp and she keeps her points succinct and on point. Systematically, she demystifies debunks the always shocking arguments that transgender individuals are simply pretending, or that they have mental illness, are simply making a choice, or somehow have malicious or abhorrent intentions in presenting the way they do. She shows the always significant distinction that sexual preference and gender identity are two completely separate things that have nothing to do with one another. Knowlton has little choice but to use the science to silence a dangerous rhetoric that can seemingly emerge at any moment. We are all aware that sexuality and gender can be fluid and that we tend to label everyone and everything. However, in a world obsessed with labels how do we identify? 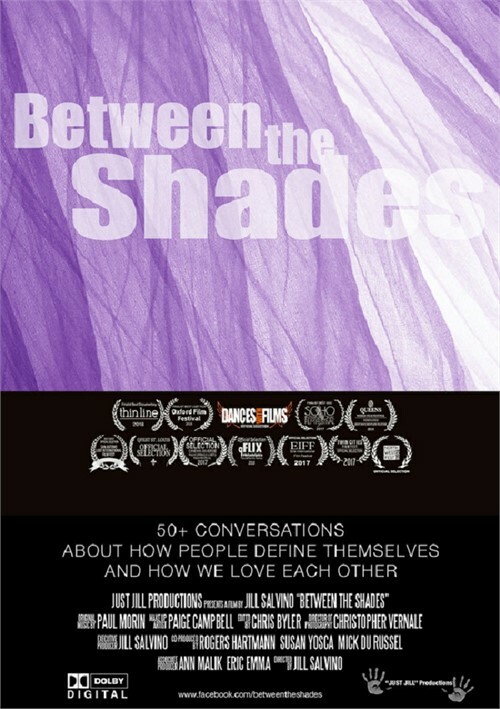 "Between the Shades" director, Jill Salvino explores the complexities of labeling sexuality. We look at power labels and our perceptions of each other and ourselves. Do they box us in or do they provide us with freedom? Using a diverse cast of everyday people to express the importance of understanding preferences, we explore whether labels are liberating or damaging since we know that we are to accept each other for who we are, not what we are. This is a very important film especially for anyone wanting to learn more about LGBTQIA, or simply trying to identify. These honest and heartfelt stories are sensitive and touching and betters our understanding of the struggles that many undergo. It us to question how we perceive ourselves and those around us. As with any other community there are many generalizations made about the LGBTQI community ? and not just from the outside. And then there are the clichés and stereotypes that seem to go along with characterizations. Many of us have said these, too and if we have not said them, we at least know them. It's something that seems to come from a human need to categorize things, to organize the world into recognizable patterns. We have a tendency to assign labels to each other (and to ourselves) that superficially define who we are and make it easy to separate ourselves from those who wear a different label than our own. Salvino undertakes an examination of the effect of labels ? both negative and positive ? and the way that they intersect among LGBTQI people. They strip away preconceived ideas about labels and the people behind them and we see the ways that labels can be as empowering as they are divisive. This discussion serves as a way to get to a detailed portrait of the community itself and an exploration of the things that make the individuals within it who they are. The film explores the various degrees of 'gay' that exist in our society and brings up a conversation about the spectrum of LGBTQI and the strands of acceptance that characterize us all. We see the faces and voices of a widely diverse cross-section of the community with participation of young and old, male and female, white and people of color. They are gay, bisexual, pansexual, transgender (MTF and FTM), intersex, gender fluid, gender queer, and yes, even straight allies. Some are coupled, some are searching for love and some are very proud singles. Throughout the film and via a loose but logical progression of themes, they discuss a variety of topics such as how they identify, growing up and coming out, family, relationships, love. What emerges eventually is a monologue that, in expressing the vast differences in experience between each of the speakers, tells a universal story of the things that make them the same. The speakers are engaged, passionate, proud of who they are and the journeys they have made. It is the honesty of their truth-telling and the director's shaping of their narrative, that makes this such an interesting film.